On 28 November 2013 the annual Foundation Governors’ Luncheon was held where a number of grant recipients were invited to join the Governors, and provide a small informal presentation of their project, that the Foundation supported, and the results so far. The purpose of the function was to provide the researchers with a chance to meet their peers and the Governors of the Foundation. From L to R: Ms Robyn Gordon – Cairnmillar Institute, Windermere Chairman of Governors – Mr Rowan Kennedy, and Dr Coral Brown – Cairnmillar Institute. Cairnmillar Institute was the recipient of a $40,000 grant to provide funding for “The Big Tent Project” in the 2012/2013 year. From L to R: Mr Ian Evans – Windermere Company Secretary, Dr Coral Brown and Ms Robyn Gordon – Cairnmillar Institute, and Dr Peter Dohrmann – Windermere Governor. 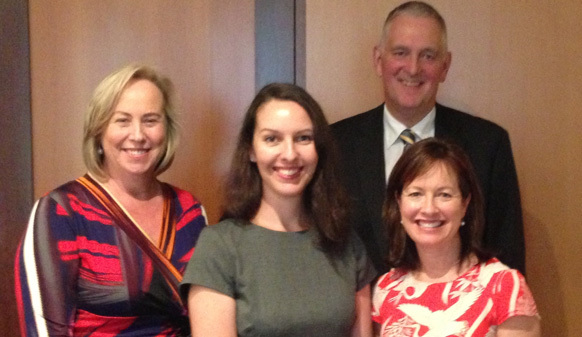 From L to R: Ms Leanne Raven – Windermere Governor, 2013 Special Grant recipient Ms Linda McAuliffe – La Trobe University, Prof John Catford – Windermere Governor, and 2013 Mary Patten Special Grant recipient, Ms Robin Digby – Monash University.